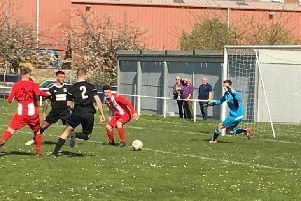 Thornton Hibs took full advantage as a daft ten-minute spell in the first half cost Dunbar United in their last ever game in the Junior ranks before moving to the East of Scotland set-up. Up until the 28th minute there was little between the sides and then Dunbar ‘keeper, Liam McCathie tried to dribble the ball past Raymond Crichton. Both players fell to the ground as the Hibs man got his challenge in but Crichton was back on his feet quickest to stab the ball into the unguarded net. Three minutes later, Thornton doubled their lead through Daniel McNab who danced past his opponent before lashing the ball into the far side-net. In the 38th minute Darren Gillon brought down Ben Anthony resulting in a red card for The Seasiders’ defender and a penalty being awarded to Thornton. Stuart Drummond made no mistake from the spot to send his team in for their half-time refreshments three goals and one man to the good. To be fair, Dunbar didn’t let this handicap affect them and they actually ‘won’ the second half thanks to Sam Young’s 71st minute shot which went high into the net. Right at the death the visitors were reduced to nine men when Zach Szemis was ordered off for a wild kick on Chris Ireland. Thornton will complete their season tonight (Wednesday) when Fauldhouse United visit Memorial Park. GI Joinery Hibs’ Man of the Match: Raymond Crichton. Dunbar United: McCathie, Thomson, S.Tait, Gillon, Szemis, Ingram, K.Tait, Handling, Young, Ballantyne, Motion. Subs: Kean, King, Chapman, Moffat, Harley.